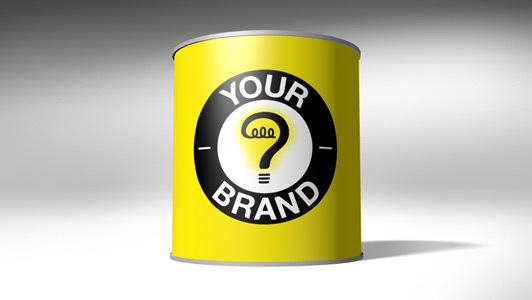 Perhaps you’re in need of brand design for your business or the products you sell. If you’re thinking of hiring a graphic designer for that purpose, it’s helpful to know a little about the design process and how you can be instrumental during that time. What is the motivation for a new identity design or refresh? What is your target market and demographic? Who are your competitors? How are you different than them? What logos or styles appeal to you and why? Does this need to coordinate with existing company colors? Where or how will you be using this? In my opinion, it’s good to aim for a brand design that’s fresh and original or else risk getting lost in the crowd. That’s easier said than done of course, as so many things have already been done. Consider that the name of a brand might be whimsical or funky as one way to be original. The imagery should coordinate with that, but make sure the design isn’t so unorthodox or out-there that it loses people. You’ll usually be applying your brand to all the various parts of your marketing effort. That might include things like print (business cards and brochures), digital (website and social media), outdoor (billboards and vehicle wraps)—and if you have one—the product itself. That’s a lot of different media, so it’s important to make sure it’s cohesive, and feels like a family. A designer can produce a brand style guide to aid with that. Consistency is what keeps your message from getting diluted or confusing. In general, the fewer people making decisions about the direction of a brand design, the more pure and focused the result will be. If you’re a business owner mulling over a new design concept, it is good to seek others’ opinions of it. However, try not to turn that process into a vote by committee, because when everyone has their say you may end up with an incoherent, watered-down result. It might also trigger many unnecessary rounds of revisions for the designer. These are just some of the things to consider when going through this task. They’re important to remember since your brand can be a great asset and productive tool that maximizes the potential of your business. For more, please see my previous article on The Merits of a Strong Brand Design. It covers what a good brand is and how it’s beneficial.